Do you ever have one of those days where something from the past suddenly blindsides you? In many ways, that's what it is like to have a loved one with a sensory processing disorder (SPD). Recently, we went through our own blindsided epiphany. Nathan is now 13 years old. And through a lot of therapy, practice and the grace of God, he is able to participate and handle most situations. Things that used to bother him don't bother him in a way that makes him meltdown...usually. We are so far past crying in restaurants and crying at prayer and fighting against certain clothing choices that I almost forget we have SPD issues...almost. Nathan had a day where he was sick and stayed home from school. He had thrown up once (a one and done as my daughter calls it) but was having some bathroom issues. Our school says we stay home for 24 hours after vomiting. I'm not one to mess with that rule so he stayed home even though he looked good, felt good, and hadn't gotten sick again. But the day proved he was tired and it was the right choice. We were able to catch up on some homework and still have time to relax and let him play video games. A few days later, we're at lunch at a popular restaurant. One that we don't go to with great frequency, but we eat there about once every other month. He even said he'd go there with our group to celebrate my friend's birthday. We are all laughing and talking and picking our food, and I'm not paying much attention to Nathan or Rebekah. They have their own system with kids menus. They look them over and use the crayons provided to circle their picks and then we make them practice giving their orders to the waitress. I look over at Nathan as she's starting at the other end of the table, his face crumples and out of nowhere, it hits. He's overwhelmed and just went into overload. Dang, I didn't see that one coming. In that moment, I was thinking, "What just happened here?!?!" Later I figured it out. 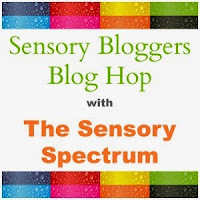 This month, I'm once again participating in the Sensory Blog Hop. 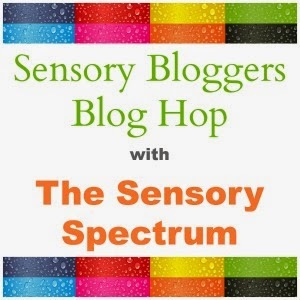 Please take some time to enjoy the other fine blogs listed below in their sensory journeys. Great job, CM! Even though you weren't quite sure what was going on, your flexibility and intuition had you doing just what was needed! As a mom of a kid that constantly has meltdowns, it' gives me hope to read your post that one day maybe ours will be further apart and he will be able to handle some of his issues. Thanks.